The Holistic Cannabis Network® is a cannabis education and training platform. 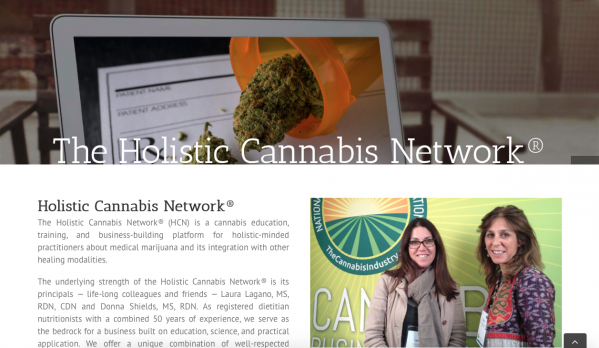 The Holistic Cannabis Network™ (HCN) is a cannabis education, training, and business-building platform for holistic-minded practitioners about medical marijuana and its integration with other healing modalities. The underlying strength of the Holistic Cannabis Network™ is its principals — life-long colleagues and friends — Laura Lagano, MS, RDN, CDN and Donna Shields, MS, RDN. As registered dietitian nutritionists with a combined 50 years of experience, we serve as the bedrock for a business built on education, science, and practical application. We offer a unique combination of well-respected credentials, functional medicine and integrative clinical nutrition experience, health communications expertise, and culinary know-how.